(Whispers) They’re in still in the freezer. I’m not supposed to be thinking about them…. I had some friends over for brunch recently and I thought I’d make scones. Traditional Australian scones are very similar to American biscuits and would go well with the rest of the menu (below) . My pantry nixed this idea when it turned out I didn’t have self raising flour—yes, I could make my own, but the texture is never as good. LUCKILY, I found some yeast in my fridge. This was strange because I so rarely make bread or yeast based baked goods. I’m try not to eat a lot of gluten unless it’s amazing. The problem is over been finding myself in the presence of some mighty fine gluten. I now know that the yeast was a gift from the angels. 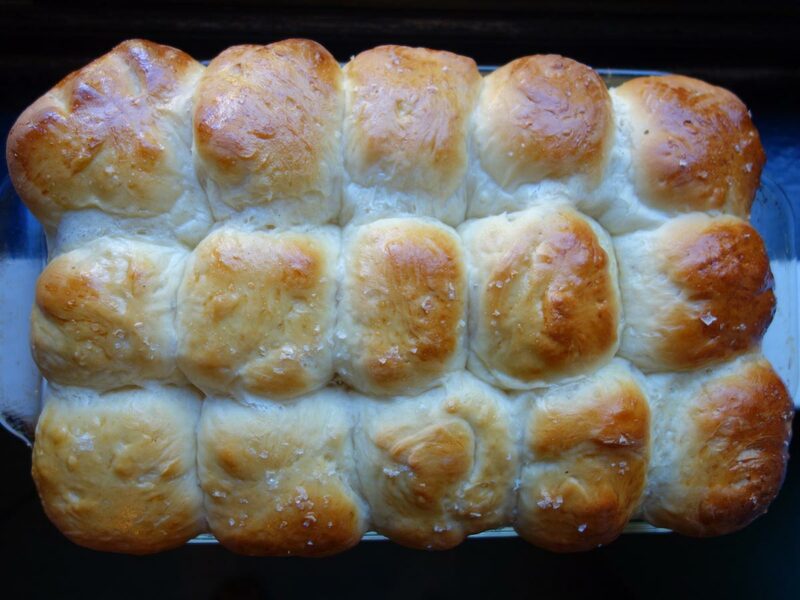 Armed with yeast, I thumbed through the internet and decided to make rolls. I couldn’t recall the last time I’d made rolls, but I got very excited at the prospect. There’s nothing so inviting than a basket of freshly baked rolls. The centers are like pillows and I just want to roll around in them. That has to be the definition of comfort food. I made the Honey Yeast Rolls from Southern Living magazine. As you can see from the photo they were gorgeous! The only change I made was sprinkling them with sea salt. The question of what to serve with them was solved when I spied the bag of maple sugar I brought back from Québec. 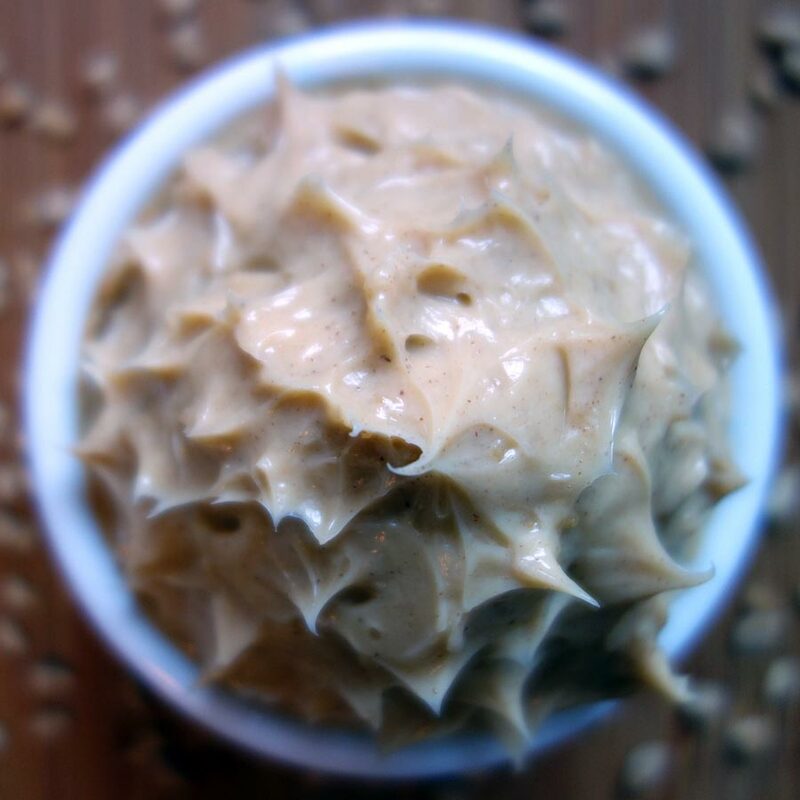 I made maple sugar butter where you blend maple syrup and maple sugar into softened butter. It was crazy delicious. We gorged on the rolls, until I had to slap my own hand. I gave most of them away because I’d made so many. FACT: people love getting the gift of rolls. I popped six of the rolls and a stash of the maple sugar butter in the freezer for an emergency. I’m pretty sure I feel one coming on. Yes, please. A blend of butter, maple syrup and maple sugar crystals that you can slathered on toast or just eat with a spoon. In a small bowl, mix butter, maple syrup and 3/4 of the maple sugar, if using. This recipe works even if you don’t have maple sugar crystals, but try to get them because they add little surprise pools of maple goodness to the butter. 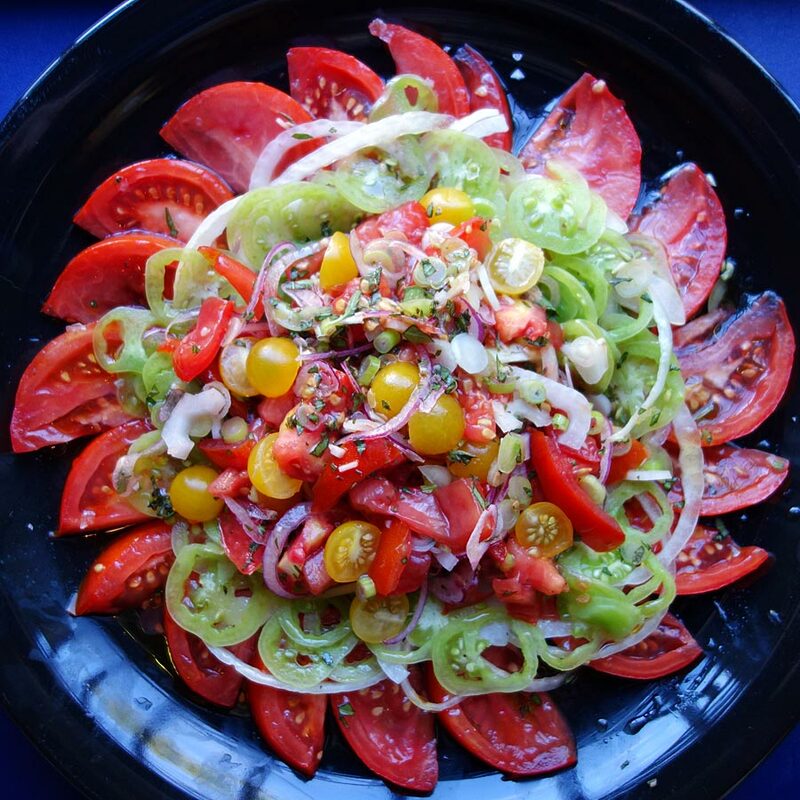 Inspired by my garden, I created a salad where green, unripened tomatoes contrast three ways with their vine ripened counterparts: color, flavor and texture. It’s a great way to use up extra homegrown herbs as well. Line a plate with paper towel and lightly sprinkle it with salt. Slice the green tomatoes thinly and arrange them on the paper towel and sprinkle the tops of the tomatoes lightly with salt. Set aside for 10-15 minutes. Slice the ripe tomatoes appropriately for their size and shape. I like to cut the large ones into thin wedges. I cut the cherry and grape tomatoes in half and the Roma tomatoes into fourths or rounds. If you only have large tomatoes, cut half of them into thin wedges and the remainder into chunks. Slice half the red onion thinly in rings and the remainder thinly into half rounds. Arrange the red tomato wedges in a circle on a large plate or platter. Top with a smaller circle of red onion rings and a slightly smaller circle of green tomatoes. Season with salt and freshly ground black pepper. Mix the smaller tomatoes or chunks with remaining onion, scallions, 2/3 of the chives and herbs. Add vinegar and extra-virgin olive oil and season with salt and freshly ground black pepper to taste. Mound mixture on the center of the plate so you can still see the green tomato circle. Garnish with remaining chives. Serve immediately. I use a serrated knife to cut my tomatoes. My favorite is a serrated paring knife Wüsthof gave me at an event I attended last year.